LAS VEGAS – We are pleased to report the the Republican Party of Nevada passed a “Resolution Affirming The Right Of Due Process Of The People,” opposing the detention provisions in the 2012 National Defense Authorization Act (NDAA) at their state convention over the weekend. Resolution G109 condemns the 2012 National Defense Authorization Act (NDAA), and the law of war, and even calls on the state legislature to take steps to block the aforementioned from being applied in their state. Last year, video of her speech went viral, garnering over 200,000 views online, and leading to a shift in sentiments toward the NDAA Resistance in her state. 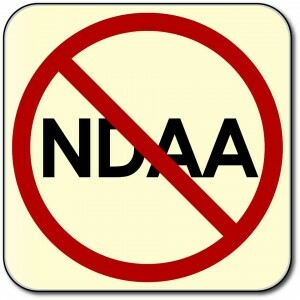 The National Defense Authorization Act (NDAA) is an annual Federal law which typically authorizes funding for the armed forces. However, in 2012, two sections, Section 1021 and 1022, were slipped in. These sections authorize the President of the United States to order the military to detain any person, indefinitely, without charge or trial, and apply the laws of war to U.S. soil. The Nevada Republican Party bucked the national party’s stance on the NDAA, and copies of this resolution will be sent to every elected Republican in Nevada, furthering the education process necessary to push back against the militarized state. Great – Now if they could also pass an Anti-Bureau of Land Management Resolution and Nullify them! Big whoop. Whereas the Republican Party is as equally culpable as the Democrat party in this travesty, they should both disband. The Homestead Act in Nevada! Cliven Bundy’s rights preclude the federal governments! ” NRS115.010Exemption from sale on execution and from process of court; amount of exemption; exceptions; extension of exemption.